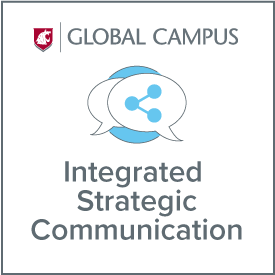 WSU’s master’s degree in strategic communication, available fully online, is designed for those who want to excel in communication, advertising, public relations and corporate communication. This flexible program is perfect for those already working as professional communicators. It is also ideal for individuals who wish to enter this field by earning trusted credentials from a university noted for excellence in communication studies. Whether you have no training in strategic communication or are a seasoned professional, this degree will advance and invigorate your career. The program’s multidisciplinary approach offers expertise in both new and traditional media, critical knowledge and skills for today’s innovative communications environment. Faculty members with extensive professional experience will teach you how to gather and analyze information and use those findings to create effective communication campaigns. The strategic communication MA provides a solid core curriculum consisting of classes in multimedia content creation, crisis communication, professional ethics, and research methods. The program also offers hands-on training in the most advanced platforms, tools and techniques. You will work closely with industry professionals and faculty to learn audio and video software, graphic design tools, new media and publication layouts. By the time you are finished, you will have created multimedia materials that are evaluated by peers and produced as portfolio-quality items stored online. This work is tailored to each individual career, or even your specific job needs. Includes weekly online instructor office hours, frequent student self-assessment tools, ongoing interaction with other students, and a cohort structure in which students go through the program with the same group. Applicants will be evaluated by the Murrow graduate selection committee, which will require official copies of undergraduate transcripts, a cumulative GPA of 3.0 or higher, and a written statement of purpose.GRE scores are NOT required. Note: This degree will not aid in qualifying graduates for doctoral-level programs at WSU or other institutions. Visit the Online MA Application Process page for details on how to apply. If you have questions about the degree, please contact Christy Curtis at christine.curtis@wsu.edu or 509-335-5608.